WheelGuard closed end bulge acorn style lug nuts are among the best in the industry. Our bulge acorn style nuts are crafted with precisely machined threads to ensure a perfect fit to your vehicle's wheel studs. Manufactured with cold forged steel for dependable strength and durability. 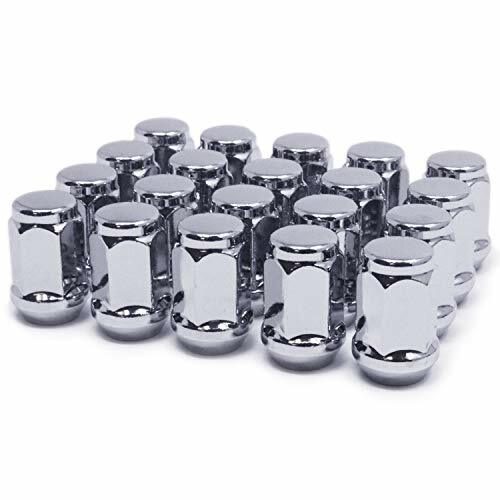 These lug nuts feature premium chrome plating with essential layers of copper, nickel, and chrome to provide exceptional strength, beauty, and corrosion resistance. Our lengthy multi-point quality control process ensures that every nut we handle is created with the same love and care as the one before it. WheelGuard lug nuts feature a solid one-piece safety design in combination with a premium triple-chrome plating process, which ensure long-time resistance to rust or salt corrosion. Solid one-piece design satisfies both aethestic and quality requirements. All products are guaranteed for manufacturing craftmanship. If you are not satisfied with our product for any reason, just contact us within a month after receiving it, and you will receive a full refund. WheelGuard Wheel Lug Nuts are your trust-worthy partner. SPECS: Solid One-Piece Design, Acorn Bulge Style - M12x1.5 thread - Conical 60 Degree Seat - 3/4 (19mm) Hex - 1.4" (35.5mm) Height - 1.18" (30mm) Inner Height - 0.9"(23mm) wide. Premium Triple chrome plating to provide exceptional beauty and corrosion resistance. Manufactured with cold forged and heat treated steel for dependable strength and durability. For AFTER-MARKET Wheel ONLY. WILL NOT FIT Factory OEM aluminum wheels from Toyota/Lexus/Scion/Honda/Acura. INCLUDES: 20 Chrome Finish Bulge Acorn Lug Nuts. Shipped in our signature premium packaging. If you have any questions about this product by WheelGuard, contact us by completing and submitting the form below. If you are looking for a specif part number, please include it with your message.